Hundreds of thousands of Iranians rallied on the streets Sunday to mark the 39th anniversary of the 1979 Islamic Revolution. Demonstrators burned American and Israeli flags, as well as images of President Trump, whose refusal to recertify the nuclear deal with world powers has riled Iranians. A few burned a white sheet reading ‘‘Barjam,’’ the Farsi acronym for the 2015 nuclear accord that Tehran signed with world powers. Such activities commonly mark the anniversary, which commemorates the overthrow of US-backed Iranian Shah Mohammad Reza Pahlavi. 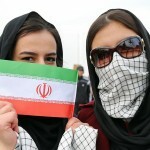 That began a period of hostilities between Iran and the West, including an attack on the US Embassy in Tehran and the subsequent hostage crisis. However, President Hassan Rouhani made a point to call for unity among Iran’s people across its political spectrum, from hard-liners backing the theocratic government to reformists demanding change. Rouhani didn’t specifically name those pushed aside, though the Islamic Revolution and its aftermath saw the Islamists surrounding Ruhollah Khomeini purge liberals, communists, and others. In his speech, Rouhani promised more job opportunities and better economic condition in the near future. Rouhani also suggested voters could push for a ‘‘referendum’’ in the country, without elaborating. Some abroad have argued for a referendum to push for an overhaul of Iran’s government. Decades after the Islamic Revolution, Tehran has had successes abroad after years of turmoil. Iran helped push back the Islamic State group in Iraq and assisted embattled Syrian President Bashar Assad in regaining strategic ground in his country’s long civil war.